Review: This was an extremely creepy, disturbing read about Ted Bundy, one of the most notorious serial killers in American history. I've watched a lot of documentaries on him over the years and while this didn't add that many new details, it was interesting read. 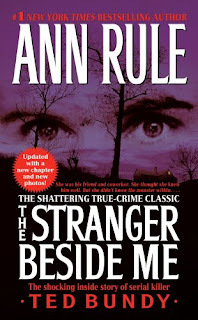 Ann Rule worked with Ted Bundy (in his mid-20s) for several months at a suicide hotline and states that they saved lives together. Even though Ann reported him to police as a possible suspect, she had trouble believing her 'good friend' Ted was a killer. They kept in contact for many years, including during his trials. Like any other true crime novel, this is a rather dry, non-emotional book. There are a lot of facts and backgrounds on the victims, but it wasn't too graphic. Ted Bundy was a high functioning sociopath and it's frightening how many people he fooled. I couldn't put this down and I was seriously freaked out for several days after finishing it.